Each spring, KAP releases reports that detail students’ performance on that year’s summative assessments. Score reports are subject-specific, so students will receive one score report for each summative assessment they took. Schools and districts also have access to reports on their overall performance. Score reports are available to teachers and other education officials through Educator Portal, the online portal for KAP assessment administration. These individuals are then responsible for distributing student reports to students. Various districts may distribute reports in different ways, for example, through the mail or at parent teacher conferences. Contact your student’s school for information on how to get your student’s score report. The front of your student’s report presents their overall performance on that assessment. 1The level score corresponds to the numbered score on the meter. This score represents your student’s performance across all sections of the test, which are described on the back of the report. Reports for students in grades 4–8 will also show the student’s score in the previous year. 2The meter shows where your student’s score falls within the range of possible scores. The segments of the meter represent the four performance levels. The regions differ in size because the score ranges for performance levels are not equal. Your student’s numeric score is displayed above the meter. 3Additional meters show the median scores of students in the school, district, and state. A median score is the middle score when scores are ordered from lowest to highest; a median score is an accurate representation of an average score. 4This list describes the skills your student has likely mastered, based on his or her performance level score. 5This section shows the range of possible level scores and what they mean about your student’s progress toward meeting state curriculum standards. The back of your student’s report breaks down your student’s overall performance into their performance on various subtopics covered by the assessment. 6This section shows your student’s relative strengths and weaknesses on the different areas of the test. Each category represents a group of test items that assess related skills. All subjects have main categories (with all-caps titles). In math and English language arts, some of the main categories are broken down further into subcategories. In math and science, each category includes a different set of items. In English language arts, some items will be counted in multiple categories within the main groups of OVERALL READING and OVERALL WRITING. For example, an item that asks about the main idea of a story will be counted in OVERALL READING, READING: Literary Texts, and READING: Main Idea. 7The symbols compare your student’s performance in each category to the performance of students who received the minimum Level 3 score. 8For further information about the standards, assessment program, and tests, please visit these websites. 9Your high school student’s scores on the KAP math and English language arts assessments are one indicator of whether he or she is on track for success on the math, reading, and English portions of the ACT. Visit this website for more information about comparing KAP and ACT scores. 10Your student will receive a Lexile® Measure in English language arts and a Quantile® Measure in math. As mentioned above, your student’s performance on each assessment is given in terms of a scale score. Scale scores are mathematical conversions of the total number of points your student earned on the assessment into a score along a predefined scale. Scale scores allow for consistent reporting of assessment results across years for any specific grade and subject area. Scale scores on all KAP assessments range from 220 to 380. Although this range is the same for all KAP assessments, it is important to note that the scale scores themselves can only be used to compare students in a single grade and subject area (for example, grade 3 math). In this context, scale score comparisons are valid across years. So, a scale score of 320 on this year’s grade 3 math assessment will mean the same thing as a scale score of 320 on next year’s grade 3 math assessment. Scale scores cannot, however, be compared across other grades and subject areas. A scale score of 320 on a grade 4 math assessment does not indicate the same level of performance as a scale score of 320 on a grade 3 math assessment. So, a student who earned a 320 on this year’s grade 4 math assessment and a 310 on last year’s grade 3 math assessment has not necessarily regressed in math. Further, a scale score of 320 on a grade 3 English language arts (ELA) assessment does not mean the same thing as 320 on a grade 3 math assessment. So, a student who scored 330 on her grade 3 ELA assessment and 340 on her grade 3 math assessment did not necessarily do better in math than in ELA. Scale scores on KAP assessments are used to place your student’s assessment scores into one of four possible categories: Level 1, Level 2, Level 3, and Level 4. These are known as performance levels. 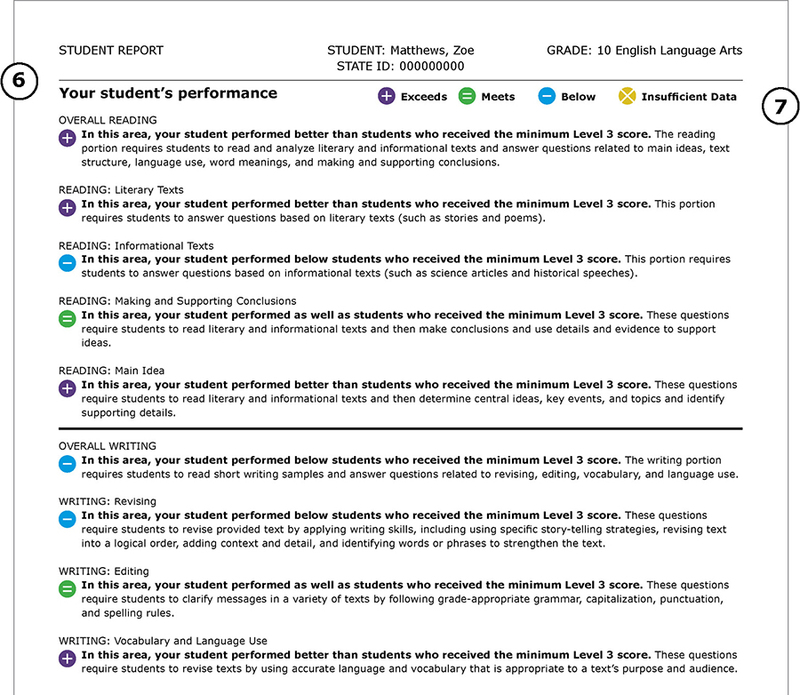 To help you understand what your student likely knows and is able to do at their performance level, a Performance Level Descriptor is available for each grade and subject. These documents provide a more in-depth explanation of expected student capabilities than the summaries presented on the front page of your student’s score report. The scale score thresholds dividing the performance levels are called cut scores. Cut scores are generally different for each grade and subject; however, for simplicity, the Level 3 cut score is 300 for all KAP assessments. Note: Cut scores for science will be made available at the end of summer. Parents can see a sampling of questions students might encounter on KAP summative assessments two ways. Additionally, actual items included on summative assessments in 2015 and 2016, as well as information about the standards those items are aligned to and information about student performance on those items, are available for download on our Released Items page. Educators and other administrators may access score reports through Educator Portal, under the Reports tab. Specific instructions for accessing reports are available in chapter 7 of the Educator Portal Manual. The reports available to you will depend on your access permissions within Educator Portal. For questions about access, contact your building or district’s test coordinator. School and district reports show the average performance of all students in that school or district. 1 This graph displays median scores for each grade. A median score is the middle score when scores are ordered from lowest to highest; median scores are an accurate representation of an average score. 2 Students’ scores fall into one of four performance levels. This graph demonstrates the distribution of students’ scores across the four levels. 3 This page shows your students’ relative strengths and weaknesses on the different areas of the test. Each category represents a group of test items that assess related skills. Both math and English language arts have main categories (with all-caps titles) that are broken down further into subcategories. In math, each category includes a different set of items. In English language arts, some items will be counted in multiple categories within the main groups of OVERALL READING and OVERALL WRITING. For example, an English language arts item that asks about the main idea of a story will be counted in OVERALL READING, READING: Literary Texts, and READING: Main Idea. 4 The symbols compare your students’ performance in this category to the performance of students who scored in the lowest range of Level 3 scores. 5 Your high school students’ scores on the KAP math and ELA assessments are one indicator of whether they are on track for success on the math, reading, and English portions of the ACT. Visit this webpage for more information about comparing KAP and ACT scores. 6 For further information about the standards, assessment program, and tests, please visit these websites. Score reports relay information about students’ performance in terms of scale scores. A scale score is a mathematical conversion of the total number of points a student earned on an assessment into a score along a predefined scale, which allows for consistent reporting of assessment results across years for any specific grade and subject area. Scale scores on all KAP assessments range from 220 to 380. It is important to note that scale scores can only be used to compare students in a single grade and subject area (for example, grade 3 math). Scale scores cannot be compared across other grades and subject areas. So, if third graders in a particular building averaged a scale score of 320 in grade 3 math last year and averaged a scale score of 330 in grade 3 math this year, the building may safely be said to have improved year-over-year in grade 3 math performance. However, a student who earned a 320 on this year’s grade 4 math assessment and a 310 on last year’s grade 3 math assessment has not necessarily regressed in math. Further, a student who scored 330 on her grade 3 ELA assessment and 340 on her grade 3 math assessment did not necessarily do better in math than in ELA. Scale scores on KAP assessments are used to place students’ assessment scores into one of four possible categories: Level 1, Level 2, Level 3, and Level 4. These are known as performance levels. Performance Level Descriptors are available to define what students likely know and are able to do for each performance level in each grade and subject. These documents provide a more in-depth explanation of expected student capabilities than the summaries presented in score reports. Educators can see a sampling of items students might encounter on KAP summative assessments two ways. KELPA2 scores are delivered through Kite Educator Portal. Parents should contact their school district for KELPA2 scores. Scores will be available in May. Interim score reports are accessed through Educator Portal. For detailed instructions, consult the Interim User Guide 2017-2018. Visit the interim score reports page for a walkthrough of the predictive interim score report.